The Shandle is a handle that easily attaches to the seat of your toilet. When I took it out the package it was installed in just seconds, Just peel and stick ! The shandle is an innovative bathroom accessory with built-in antimicrobial protection that makes lifting the toilet seat easier and cleaner than ever. The Shandle is available in tons of styles ensuring that there is a Shandle for you ! The Just For Kids line includes a variety of cute and colorful animal designs with reminders for young kids such as "Put the Seat Up," "Put the Seat Down," and "Wash Your Hands." 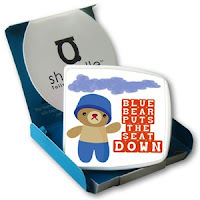 They also have an adult line which include Bowl'd Statments, Humor & Decorative Shandles. 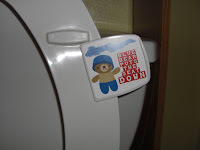 As a mom of 3 boys that lift the seat I think this product is wonderful ! No more touching the toilet seat !!! 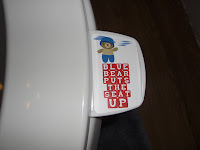 It is also great for them to have a cute reminder to put the seat back down, which is a plus when mom goes to sit !!! How cool is that? I'm gonna go check them out now. Great review! THanks! This thing looks so cool! Wow I love this with a houseful of kids!